The Xerox VersaLink B605 is a robust multifunction printer with a large touch screen for easy inputs and smart workflows. The device has all the copy, email, and scan functions you would expect from an office workhorse, and it is supported by a wealth of modern features. Xerox ConnectKey technology acts as a smart workplace assistant, allowing users to create electronic documents, use mobile apps for common tasks, and print from the cloud securely via a tablet-like interface. 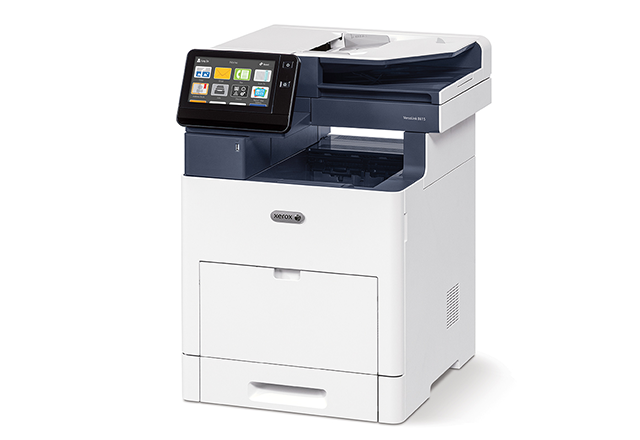 The Xerox B605 has a compact, desktop design with a 700-sheet capacity. Print resolution tops out at 1200 x 1200 dpi, and maximum copy resolution is 600 x 600 dpi. The device has 2 GB of RAM memory and a 1.05 GHz processor for smooth inputs and fast output: print speed can reach an impressive 58 ppm, with first page coming in at under 8 seconds. Users have several ways to connect the B605 including Ethernet, USB 3.0, and NFC tap to pair. Its print, copy, and scan features are extensive, so users should be able to tailor the Xerox VersaLink B605 to their specific work or home office requirements. The large touch screen located near the input tray makes it easy to swipe, pinch, and scroll through an intuitive interface and access all of the important functions available. Print quality is excellent, as is the output rate of almost a page a second. Optional extras can increase input capacity significantly. The Xerox VersaLink B605 offers long-term reliability and high-quality output in a relatively small footprint. The VersaLink B605 is very noisy during operation, which may make it unsuitable for smaller officer environments. There is no Wi-Fi as standard, though it is available as an optional extra. Standard paper capacity is also relatively low.